This article from the Minneapolis Journal was written after Nebraska's 7-0 win over Knox. It was the next to last game for the 1902 Cornhuskers, who would win every game by shutout. PRAISE FOR NEBRASKA Ralph Hoagland Says Cornhusker Team Is One of the Strongest in the Country. Special to* The Journal. Lincoln, Neb., Nov. 18.�The triumph of the Nebraska cornhuskers over the doughty K n o x college eleven on Saturday w a s m u ch more decisive than the score, indicates. Nebraska marked up s e v en points, but carried the ball five yards to their opponents' one, while their o wn go? I w a s never in danger, the nearest the Gal jsburg lads got to the cornhuskers' goal being forty yards. . Nebraska o c c u p k s the rather unique position of being the only college eleven of any class in the country which, for the present year, has kept its goal from being crossed. The Missouri ; tigers, after a fumbled punt on which they secured the ball, once rushed the leather down to Nebraska's seven-yard line; but thereafter the cornhusker line refused to budge and their goal w a s still unsullied. Minnesota once w a s on Nebraska's thirty-flveyard line, but could g e t no nearer, while practically three-fourths of the play w a s in t he gophers' territory, Nebraska .secured but one touchdown, but it w a s the result of straight football, in which the cornhuskers fought their way squarely and fairly for fifty yards before working the ball over the goal. 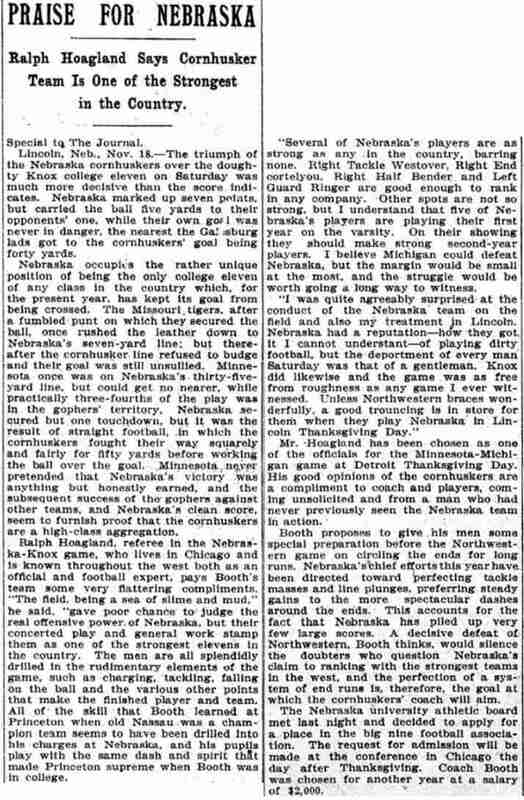 .Minnesota..-ne^yer pretended that Nebraska's victory w a s anything but honestly earned, and the subsequent success of the- gophers against other teams, and Nebraska's clean score, seem to furnish proof that tlie cornhuskers are a high-class aggregation. . Ralph Hoagland, referee in the N e b r a sk a - K n o x game , who lives in Chicago and is known throughout the w e st both a s an official and football expert, p a y s Booth's team some very flattering compliments. "The field, being a sea of slime and mud," he sard, "gave poor chance to judge the real offensive power, of Nebraska, but their concerted play and general work stamp them a s one of the strongest elevens in the country. The m en are all splendidly drilled in the rudimentary elements of the game , such a s charging, tackling, falling On the ball and the various other points that make the finished player and team. All o f - t h e skill that Booth learned a t Princeton when, old N a s s au w a s a c h a mpion team s e e ms to have been drilled Into his charges at Nebraska, and his pupils play with the same dash and spirit that made Princeton supreme w h en Booth w a s in college. "Several of Nebraska's players are a s strong a s any in the country, barring none. Right Tackle Westover, Right E nd cortelyou, Right Half Bender and Left Guard Ringer a r e . good enough to rank in any company. Other spots are not so strong, but I understand that five of N e - braska's players are playing their first year on the varsity. On their showing they should make strong second-year players. I believe Michigan could defeat Nebraska, but the margin would be small a t the most, and the struggle would be worth going a long w a y to witness. "I w a s quite agreeably surprised a t the conduct of the Nebraska team on the field and also my treatment ^n Lincoln. Nebraska had a reputation�how they got it I cannot understant�of playing dirty football, but the deportment of every m an Saturday w a s that of a gentleman. K n o x did likewise and the g a me w a s a s free from roughness a s a ny g a me I ever w i tnessed. Unless Northwestern braces w o nderfully, a good trouncing is in store for them w h en they play Nebraska in Lincoln Thanksgiving Day." Mr. Hoagland has been chosen a s one of the officials for the Minnesota-Michigan g a me at Detroit Thanksgiving Day. H is good opinions of the cornhuskers are a compliment to coach and players, c o ming unsolicited and from a m an w ho had never previously seen the Nebraska team in a c t i o n . ! . � '. Booth proposes to give .his m e n some special preparation before the Northwestern g a me on circling the ends for long runs. Nebraska' s\;hief efforts this year h a v e been directed toward perfecting tackle m a s s e s and line plunges, preferring steady gains to the mor e spectacular dashe s around the ends. This accounts for the fact that Nebraska has piled up very few large scores. A decisive defeat of: Northwestern, Booth thinks, would silence the doubters w ho question Nebraska's claim to ranking with the strongest teams in the west, and t he perfection of a s y stem of end rung is, therefore, the goal a t which the cornhuskers' coach will aim. The Nebraska university athletic board m e t last night and decided to apply for a place in the big nine football association. The request for admission will be made a t the conference in Chicago the day after Thanksgiving. Coach Booth w a s chosen for anothe r year a t a salary of $2,000.